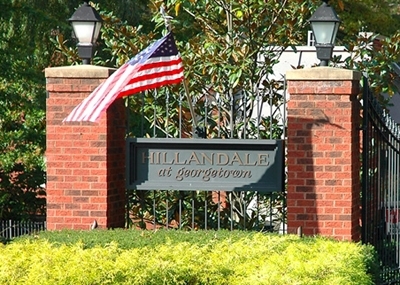 Hillandale is a gated luxury community situated across from the Georgetown University Medical Center in the northwest quadrant of Washington, DC. Just steps from Georgetown, the community is an urban escape surrounded by the 250-acre Glover-Archbold Park on two sides and distinguished by ponds, wildlife and a variety of blooming flowers in the spring. Originally built as the country estate of Anne Archbold, the daughter of a wealthy industrialist and a strong supporter of parks and conservation, Hillandale was later developed in this same spirit in the late 80s. Hillandale comprises 268 properties including 163 rowhouses, 68 semi-detached houses and 37 detached single-family homes. Many of the homes feature garages, elevators and other custom finishes such as moldings and vaulted ceilings. The homes are set back from the eight streets that make up the community to allow for a secluded and private resident experience. Amenities include a swimming pool, tennis courts, tot lot, and spacious clubhouse for the variety of social activities the active homeowners’ association runs on an ongoing basis.